Oxford Genetics Ltd, a leading biotech which specialises in DNA design, protein expression optimisation and cell line development technologies and services, has moved its operations to new, state-of-the-art laboratories at the Park. The move from Begbroke Science Park to Medawar Centre I increases the company’s laboratory space to 5,700 sq ft and forms part of Oxford Genetics’ on-going growth strategy as it expands its operations to support new services for cancer fighting technologies. The company has experienced rapid growth in the last 12 months and has scaled its infrastructure and team to support its customer base in the biopharmaceutical industry. 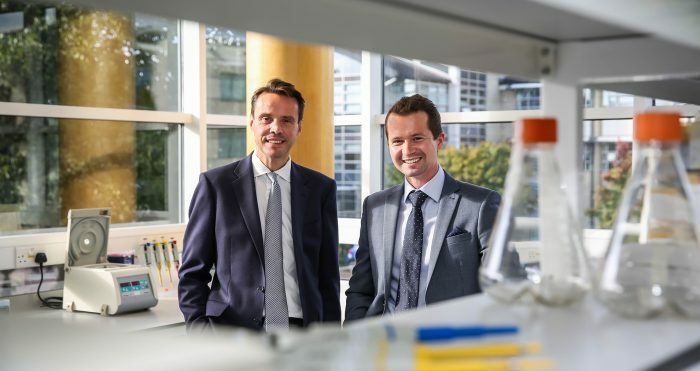 Oxford Genetics will use its new location to increase research and development into services to support cell and gene therapy, which is currently being trialled as a potentially effective, non-harmful treatment for cancer and other disorders, and is a sector identified by the company as a key market for growth. The new facilities will also include dedicated cell development suites and new robotic platforms for process automation. This will allow Oxford Genetics to scale its services, following an increase in demand from new and existing customers. The company has achieved significant growth in the last year, expanding its customer base primarily in the biopharmaceutical industry. It has also created more jobs for the local scientific community, growing in less than a year from just three employees to over 25. The opening of Oxford Genetics’ new facility follows the recent announcement that the company has appointed three industry veterans to its board: Dr Matt Baker, Dr Paul Brooks and Dr David Hames. The appointments further strengthen its position as a market leader in DNA design, protein expression and virus and cell line development.